Tomorrowland Malta 2018 - the biggest gathering is coming to Malta, a new novelty for our island. International DJs will be performing on Saturday July 28th at the Marsa Sports Grounds and through a live screening connection from Belgium. The event will be a day of partying united with millions of fans united with others from around the world. A grand stage a 35 metre specially designed with a synchronised grand light show and pyrotechnic colourful effects. 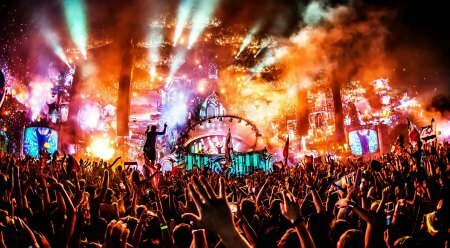 Tomorrowland as it is called is the most famous and largest music festival in the world and is held in Boom, Belgium every year since 2005. This is an electronic music festival held over two weekends. It is so popular that tickets are easily sold out. This is an amazing time for Malta and tickets are selling fast. The live connection between Belgium and the rest of the world is an exceptional unique opportunity. It will be broadcasted live on a unique UNITE With Tomorrowland stage with 3 Main stage headliners. Lines are open to buy the tickets where we give you the various the various ticket links below. For 2018 the weekend festivals in Boom are on the 20th,21st, 22nd July and 27th, 28th, 29th July from 12:00 to 23:00 each event. This festival consists of music festival escape. Get your tickets now and enjoy a wonderful day. EDM artists will be transmitting over Boom in Belgium and give out the best electronic music. The lineups for Belgium 2018 still has to be announced. The lineup of the DJ’s coming to Malta has to be announced. The links and information of location and dates below are of 2017. The tickets and all information for 2018 have not yet been published. - Stop at MORO bus stop. - This is located on a 4 lane main road just under a pedestrian bridge. - After descending the bus, use this pedestrian bridge to cross to the other side where there is the main entrance to the Marsa Sports Ground. - Catch bus from Il-Marsa bus stop which is beside the main Marsa Sports Ground entrance. - Stop at Il-MARSA bus stop. - After descending the bus, the entrance to Marsa Sports Ground is beside the bus stop. - Catch the bus at MORO bus stop. - To reach the bus stop cross the road from the pedestrian bridge. Google map for the venue location and public transport buses.